Shorter races, like a 5k or even an 8k are often referred to as "fun runs." I never really did understand this, because running, no matter how much I enjoy the results of it, isn't really that fun for me. However, after training for and running a marathon, I now at least sorta feel like anything shorter than say eight miles is "fun." At least in the sense that it will probably only take me an hour or so to complete. 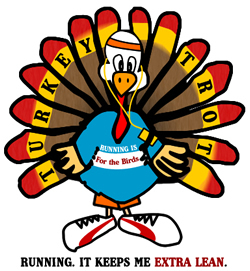 So, in the spirit of running a race a month and in an effort to pre-burn calories before the Thanksgiving meal, Mr. H. and I signed up for the Cleveland Turkey Trot five-mile race. Originally I thought this was a 5k, not a five-mile race. But hey, what's a couple extra miles, right? Actually, not that bad, though there was a hill right in the middle that slowed me down. The good news for me is that after all that marathon training, I really have increased my speed. I finished in 46:57, which was 91 out of 296 in my age group and 3163 of almost 7,000 runners. Mr. H.'s stats, for those of you interested, were 20/251 age group, 401st overall; finishing time of 35:17.22; 7:03 pace. My pace was 9:23. I'm really happy with that. I'd like to keep pushing myself to a pace closer to 9 minutes, at least for a 5k. But to do that, I really need to get back on the wagon about running during the week. A once a week 4-5 mile run on Saturday or Sunday just isn't going to be enough. During my marathon training, I had been lucky enough to be able to find some time during the week to run on the treadmill in our small workout room. I've been working on a couple of larger projects at work, so I haven't been able to find that time. I keep telling myself that I need to get up early and run before work. But with the temperatures dropping, I'm not sure how realistic that will be. Mr. H. and I need to find a race for December to run. 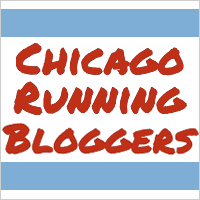 In January we're thinking of doing a 1/2 marathon in Chicago - cause we're crazy like that. I predict it will either be a slow run because it's so icy or a fast run because it's so cold and I want to get it over with. Either way, it'll be interesting. As an added bonus, you can see the one and only photo they managed to capture of me: http://www2.brightroom.com/105115/3142, lovely isn't it. Mr. H. fared better: http://www2.brightroom.com/105115/3141. A blog topic for another day, why-oh-why my race photos are usually dumb looking.